Hello blog. I've missed you. I've been away for a few days (again) and honestly I don't know how my hubs travels like he does. I've been on four flights and in four different states since the first of August and I'm pooped. We got home at 11:30 PM last night and I feel like I could sleep for a week. Hubs got up at 6:15 and went to work. Yay hubs! Anyway, I have much to say about my travels but today is Wednesday and The Random Dozen has returned from its blogholiday so I think I'll take the easy way out and play along. After that I will tackle the mountain of laundry, fill my empty refrigerator, pick up the dog from the kennel, take a nap and finally, collect my thoughts for a post later about Ronnie and Kix, fun in the city, and catching up with a friend from my England days. You can hardly stand it I know. A week ago at a friend's surprise 50th birthday party which was celebrated with old friends from our college days. We crack ourselves up. 2. If you found $10 today what would you do with it? Probably add it to my grocery money. My refrigerator resembles Mother Hubbard's Cupboard in the worst way right now. At the moment no. I have been enormously slightly over committed as a volunteer for the past several years and when we moved I decided to give myself a year to really get settled into a new town and see what's out there before I acted on my 'jumping in head first' tendency. 4. What is your favorite summertime veggie or fruit and how do you eat it? corn on the cob-rubbed with a little bit of butter, wrapped in foil and roasted on the grill. I am gonna miss the fruits and veg of summer. 5. Is your social sphere (circle of friends) small, medium, or large? One of the benefits of moving a lot is you have friends sprinkled all around the world. And we do a pretty good job of keeping in touch and seeing one another every chance we get. We love our peeps and we have a large circle of friends although I will say in our new little town our circle is still small. We have spent many a weekend in the year we've been back stateside traveling to see friends and family elsewhere so we haven't built new friendships here as quickly as we normally do. My family spent a weekend here in July celebrating my mom's 80th birthday. I wrote about it here...we had a great time and I don't have all my sibs and the kid cousins together nearly as often as I'd like so that was wonderful. A couple of weekends ago we flew to Atlanta to surprise a college friend for his 50th birthday. Lots of other friends from college were there so it was a mini reunion of sorts. See #1. 7. When you're feeling blue what is the best way someone can cheer you up? We took an early vacation since my girls had jobs to get busy with and my husband had an insane amount of work travel all summer long. We spent a week in Marco Island Florida just after daughter1's university graduation. It was heavenly. You can read about it here. Oh and also here. I know...I'm wordy. I can't think of anything but I'm sure my husband would have an answer. Just yesterday he was commenting on the contents of my purse. Or the black hole as he likes to call it. Toy Story 3. Okay, Inception was good and made me think and has kinda stayed in my brain but Toy Story 3? That was too sweet! Sunshine + a beach + a soft breeze + my feet in the sand at the edge of the ocean + a book in my hand + my family beside me = perfection. 12. Please share a favorite photo from the summer so far. It's so hard to choose but I guess I'm going with a photo we took on holiday in Marco...it was a happy restful week of family togetherness in a beautiful setting. Family vacations are THE BEST! Loved reading your answers, as always. Do you count cyberfriends, too? If so, count me in your circle. Yay for the Random Dozen's return!! I love, love, love all the summer fruits and veggies, definitely gonna miss them when they are gone. And Toy Story 3 was a fantastic movie, but I went with Inception over it as my favorite. But Toy Story 3 definitely tugged at my heartstrings. Love your summer pic. I need some beach vacation time, pronto. P.S. Psalm 139 is one of my all-time favorite passages of scripture, so I love the verse on your page! Welcome home! Ditto on the perfect summer day!! Loved your answers. I've missed you while you were traveling! Glad you are back and I am trying to "be back," too! I have missed you! #12 - Why am I reminded of the Cialis ads with the two bathtubs? BTW, I love your new blog header. Your picture and the description of a summer fit perfectly. Looks amazing! I loved the latest Toy Story 3 movie. Sorry to see the series finally end! Loved your summer picture. Oh how I wish I was there. I absolutely LOVE that picture. It's so peaceful. Enjoyed my first stop by your blog today. Enjoyed your great answers and can't believe you stopped to blog before unpacking. How funny! wish I could do that. I sometimes forget that whatever it is that I need to do will be right there waiting on me when I get through with something else I'm doing. Blessings to you! Chocolate is always good! I love your picture--looks like a great vacation! Beautiful photo! 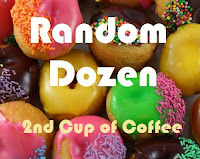 I enjoyed reading your random dozen! # 11 - perfect description. I don't even like summer, but I like it your way! Sounds wonderful! #9 The Black Hole, LOL!!!! I was thrilled when it came back :) I too loved Toy Story 3! Inception was awesome too!